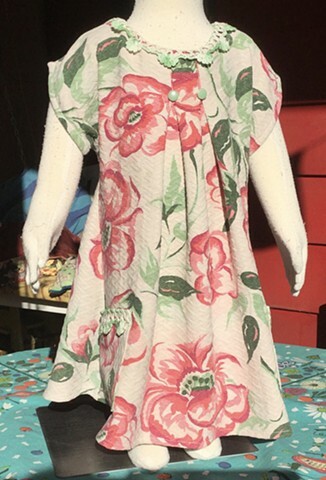 Made from an unusual vintage curtain, special textured waffle weave dress with big wild roses print and sea-foam green crocheted trim around neck and pockets. Buttons down back with large white antique buttons, size Pre-School (3-4 years), measures 26“ armpit to armpit, 19“ shoulder to hem, delicate green buttons define front pleats at yoke. 100% cotton, washable, $50, made by the designer herself and shipped free to any address in the U.S.